Are you moving into a new home this summer? Congratulations! The summer season is a great time to explore a new neighborhood and make your house feel like a home. Unfortunately, summer is also the top season for home burglaries. While you’re getting settled, be sure to use these tips to make your beautiful new home less of a target to potential criminals. If your new home didn’t already have a security system when you moved in, now is the time to install one. There are so many types of security systems available at many different price points. 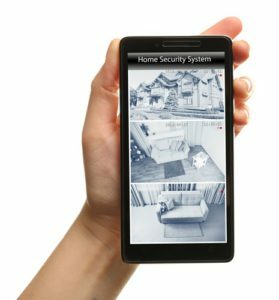 You can opt for a set of surveillance cameras you install and monitor yourself, or choose a system that includes remote monitoring by a third party. The most important thing to remember with a home security system is that it doesn’t help you if you don’t set the alarm. Always be sure the system is engaged when you leave the house. Burglars will look for the easiest point of entry to your home, which is often the garage. Always keep your garage door locked, and use a quality, heavy-duty lock. Overgrown bushes, trees, and shrubs can provide easy cover for criminals. Keep your yard tidy so there are fewer places for burglars to hide. Install motion lights or other outdoor lights so there are no patches of darkness. Are you taking a vacation this summer? While it’s tempting to talk about it on social media, you should keep it under wraps. Don’t advertise to potential criminals that your house will be empty during your vacation. Wait until you’re safely back at home to share the details of your amazing trip. Neighbors can be your first line of defense when it comes to break-ins. When you move in, introduce yourself to your neighbors. If you’re going to be out of town for any length of time, let them know. Tell them you’ll keep an eye on their house when they’re away, and ask if they’ll keep an eye on yours. If you’re working in the yard, it may be tempting to leave your garden tools out until you’ve completed your job. But leaving valuable items in the yard is an invitation to criminals and it makes their jobs easy. The same is true for kids with their bikes and toys. Always put your valuable items away when you’re done using them for the day. You may think you’re being sneaky by hiding a key under the doormat, but that’s the first place any criminal is going to look. The same is true for those rocks, sprinkler heads, and other clever devices that are meant to hide keys. Criminals shop in stores, too, and know to look for them. If you’re worried about getting locked out, then leave a key with a trusted neighbor, friend, or family member. Lastly, though it may be tempting to open the windows and keep them open on a beautiful day, don’t. Even if you think you’ll only be gone for a few minutes, always close and lock all windows when you leave the house.